Robert Altman's "Quintet" is a confusion in unsuccessful quest of a resolution, and the nearest Altman has ever come to a completely inexplicable film. He has always been a filmmaker of peaks and valleys; his great films are masterpieces, but he can also make some stinkers. But not even with little-seen films like "A Perfect Couple," "H.E.A.L.T.H.," and "Beyond Therapy" has he made a film that defies any attempt to explain it. "Quintet" is a fantasy set in the future, in a world overcome by a new ice age. Continents and cities are buried by snow, and the surviving humans trek great distances to the remaining outposts of civilization. And that's all very well (and stunningly well photographed), except that when they get to where they're going, they spend the rest of "Quintet" playing a deadly board game that we never figure out. Altman locates his future within a bleak futuristic "hotel" that's inhabited by people from many different nationalities, and presided over by the mysterious "St. Christopher." Christian tradition has Christopher as the patron saint of travelers, but the travelers who arrive at this hotel have a disconcerting way of turning up skewered through their vital organs. The murders are dictated by Quintet, a five-sided board game that occasionally accommodates a sixth player. Because the game is presumably central to the film, and because everyone in the film seems to consider it a gravely important competition, I found myself actually leaning forward in my seat, straining to see how it was played and what the rules were. I failed. I failed, too, to find any great interest in the relationships among the characters. 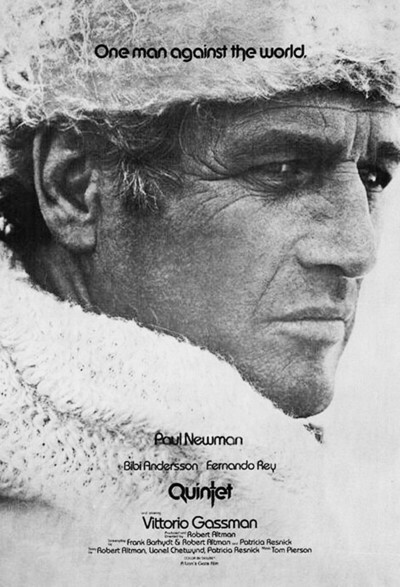 Paul Newman stars, as a trapper who walks in out of the cold and finds himself swept up in the intrigues of the hotel. Other people, especially Bibi Andersson, Vittorio Gassman and Nina Van Pallandt, plot and gossip against each other. And the action is punctuated by dead bodies suddenly discovered, by obscure moral points made with great intensity, by things that would be symbols if we knew what they symbolized. Altman has been obscure before, especially in "Images"" (1972), a film that seems baffling on first viewing but eventually reveals great subtlety and richness. With "Quintet," though, I'm not even sure he's being willfully obscure. Stories about the history of the film seem to suggest that "Quintet" is one that got away. One of the film's stars, Fernando Rey, said in a recent interview that Altman scrutinized the rushes every day, attempting to discover where his actors were "leading" him. Were they leading him—or really waiting for directions? In an interview in Variety, 20th Century-Fox boss Alan Ladd, Jr. alludes to "problems" with the production and hints that Altman didn't have final say on the finished film. It's possible, then, that "Quintet" doesn't represent a finished, or at least a successful, version of the ideas Altman started out with. I can't really say. I can say, though, that I miss the good humor, the human warmth, that occupies such recent Altman films as "Nashville," "A Wedding" and even parts of "3 Women." And I miss the ongoing sense of a human community that fills so many of his films. The people in "Quintet" are cut off—from each other, from their society, from the game of Quintet, and, ultimately, from a unifying vision that would have carried the film. "Quintet" is a puzzlement, and not a very interesting one.